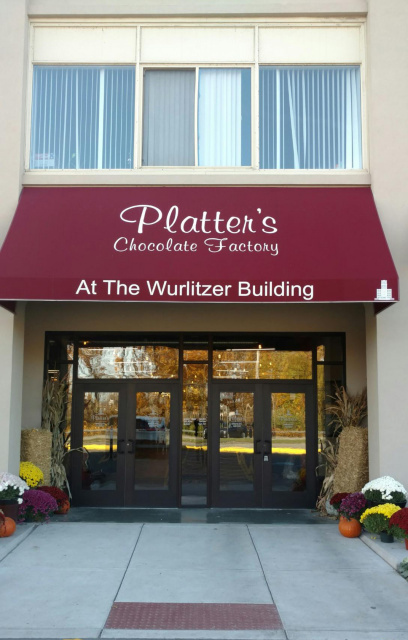 On Wednesday, March 8th at 7:00 PM, John DiGuiseppe retold the history of Platter’s Chocolates from a basement to the dramatically enlarged and beautifully designed facility recently opened in the historic Wurlitzer Building at 908 Niagara Falls Boulevard in North Tonawanda. John is the husband of a daughter of the next generation of Platter chocolate makers, and embracing the amazing journey of the company, he now serves as Vice President of Business Development. He not only enthusiastically relates the company’s history, but seeks anyone’s memories of their experiences with this famous chocolate. His tour of the new chocolate-making facility included information on the challenges of temperature control and equipment. He also told us about a possible connection between Carl Platter and the Wurlitzer factory. The fully glass-enclosed manufacturing area allows you to easily view the various candy making operations. 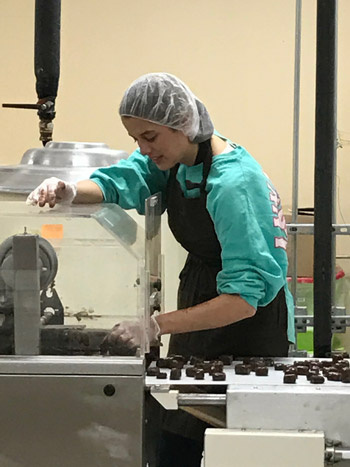 There is also a connecting hallway that allows you to view historical photos of the original Wurlitzer Company’s past operations, a beautiful display area of chocolates, a wall with some of Carl Platter’s original chocolate molds and a relaxing ice cream shop complete with fireplace. 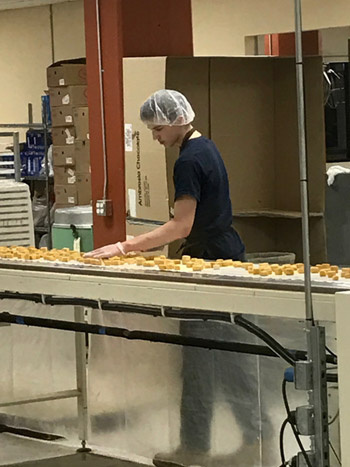 The first two photos show part of the factory operations attendees saw on the tour of the Platter's candy-making facilities. The sponge candy inspection process before the chocolate is added. Photo courtesy of Rose Marohn. The machine "robes" the chocolate on each piece of candy as it moves down the line. Photo courtesy of Rose Marohn.